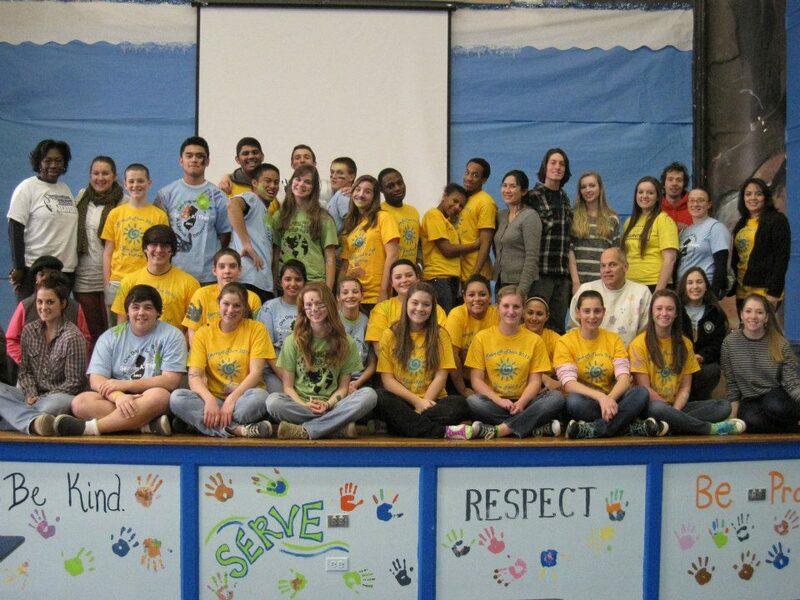 Our Martin Luther King Jr. Kickoff Celebration and Day of Service were a huge success. Our Kickoff Celebration was held on Sunday January 20th at Newton High School. 100 people gathered for music and motivation. The night started off with guest speaker Bob Jones, Sparta high school teacher, speaking on modern day forms of successful non-violence. People in attendance were moved by his speech and it set the night off on the right foot. After Bob Jones’ speech Newton high school alum, Scott Paul and his band the Parlay stepped on stage. Scott and his band rocked the crowd for the remainder of the night and it was an overwhelming success. Mini-service projects were going on throughout the night. We made Valentine’s Day cards for seniors, Letter Books for after-school programs, letters to female soldiers and quilt squares to be made into quilts for soldiers overseas. Our MLK Day of Service was an equal success. Volunteers met at Newton High School at 8 a.m. to be bused and carpooled to S. 17th St. Elementary School in Newark NJ. Over 40 volunteers came out on their day of from school to serve at the school where murals were painted and the school was beautified. The day was incredibly inspiring. To see young students serve with such enthusiasm so early in the morning on their day off moved all of us. Paint, brushes and all other materials were donated to us and we had an abundance of local support. We ended the project with painting our hands and putting our hand-prints on the stage in the cafeteria. We were so lucky to have the S. 17th St. School Student Council working with us as well. At the end of the day we all met and reflected on the day. Every volunteer had something positive to say and they all said they would return and serve again next year. It’s days like this that really confirm why we do what we do; everyone loves to serve and we are so lucky to have the power to give teens the opportunity to do so. This past weekend, I found myself exhibiting a strange reaction. For the first time in a long time, I was genuinely excited to be spending a Saturday night indoors. Why, you ask? Because this Saturday night marked my first event with Pass it Along, and from what I had heard during the week leading up to the event, this year was on track to be an outstanding showing. Saturday, January 19th was the annual Pass it Along Dodgeball Fundraiser at the Sparta Fieldhouse. When I got to the Fieldhouse in the late afternoon, there was already a strong presence of PIA student members and program associates buzzing around, setting up at the soon-to-be registration tables, snack stand, and publicity booths. Then the game referees started trickling in, in their striped shirts that belied their identities as the makers—or breakers—of teams’ spirits for the evening. Things were getting serious. Pretty soon, I found myself at the registration table. As a newcomer to Pass it Along (my first day was on Monday), I loved that the group trusted me enough to throw me into the center of the action…well, the center of action for the moment, at least. The next hour passed in the blink of an eye as excited teams finished filling out waiver forms, made last-minute additions to their rosters, and received their raffle tickets for the door prizes donated by some very generous local organizations. Thankfully, we made it through all of the approximately 300 registrants without a hitch, and by 6 pm, the tournament was ready to get underway. The center of the action was now squarely placed upon the three dodgeball courts, and I was relieved that the spotlight was off of my limited abilities as a registrar and on to the teams and players, especially since lots of spectators and fans had showed up during the registration hour, and they were clearly eager for some action. During the hours that followed, hopes were elevated, just to be dashed by the next round; calls of different degrees of merit were levied; and players ducked, dodged, and dove to varying degrees of glory. For me, it was just great to see everyone who participated come out to support a great cause and have a great time while they were at it. For others, like the Prestige Worldwide crew, it was more serious. Through the concerted efforts of their well-orchestrated team, the crowd looked on as they took on the bracket, team by team, eventually claiming the title of 2013 Pass it Along Dodgeball Champions. Also notable were the Average Joe’s, whose rip-off of the blockbuster film seemed to give them an edge on the court for “Most Spirited,” while the Sitting Ducks’ catchy “Quack” motto and robust fan base won them “Crowd Favorite” and “Best Uniform” categories. And, thanks to the bracketeering prowess of the illustrious Miss Kathy and the expert emceeing of PIA board member Tim, the continuous bouts of dodgeballing ran smoothly, and no one in attendance missed even a moment of the high-stakes action. -Written by Maren Morsch, AmeriCorps Program Associate.